Discover the variations of Right Angle Weave stitch. This versatile bead-weaving technique can be used to create your own handmade beaded jewelry. Right Angle Weave (RAW) is a very popular bead-weaving stitch. Beadwork created using this technique is made up of beads that lie at right angles to one another. It’s a very versatile stitch and can be used with any combination of sizes or shapes of beads. This is probably what contributes to its popularity. There are many variations of RAW varying from flat to 3D designs. Let’s delve a little deeper into each variation. When working in single needle right angle weave, you’ll typically pick up four beads and weave them into a unit by travelling through the beads in a circular fashion. You can add onto that first unit to create a strip of RAW by sharing at least one bead between units. Weaving in single needle RAW, requires you to alternate between working in clockwise and counterclockwise directions. This often confuses beaders that are new to the stitch. Try this free Heart pendant tutorial. Crossweaving is when you attach a needle to both ends of the same piece of beading thread. You center a finding or bead on the thread and work from there. This type of RAW produces the same end result as the single needle version even though they have very different thread paths. As you crossweave, both needles will need to “cross” through the shared beads between units. To do this, you pass the right-hand needle from right to left through a bead. Then, pass the left-hand needle from left to right through the same bead. The bead that you have crossed through should have two pieces of thread exiting both ends of it. In jewelry-making classes I’ve taught in the past, I’ve always had at least one beader who passes both needles through the same side of the bead. After passing the right-hand needle to the left, that will become the left-hand needle when creating the next unit and vice versa. Whereas both single needle RAW and crossweaving will produce flat beadwork, tubular right angle weave stitch is perfect for making beaded ropes. Tubular RAW typically requires a central support as the beadwork is hollow and not stiff enough to support itself. You can use rubber tubing to fill the gap and prevent the rope from collapsing. There are two ways that you can create a tubular right angle weave rope. The first is to use a support e.g. a dowel and create rows of the stitch around that. The second way is to make a flat strip of tubular right angle weave and then join the ends together. I personally prefer the second method. Cubic right angle weave (CRAW) is a three-dimensional stitch. It’s basically made up of stacks of cubes joined together. This stitch is much sturdier than tubular RAW and doesn’t require a central support. The two variations have very different thread paths. Prismatic right angle weave or PRAW is where you create stacks of beaded prisms. Each prism has a specific end shape. The shape could be a triangle, square, pentagon, hexagon or any shape with more sides. A prism with a square as its base is known as a cube. This means that CRAW is actually a special type of PRAW. You can use the Right-Angle Weave variations to make beautiful jewelry from simple, flat designs to intricate 3D pieces. I’m happy to hear you like my tutorials. 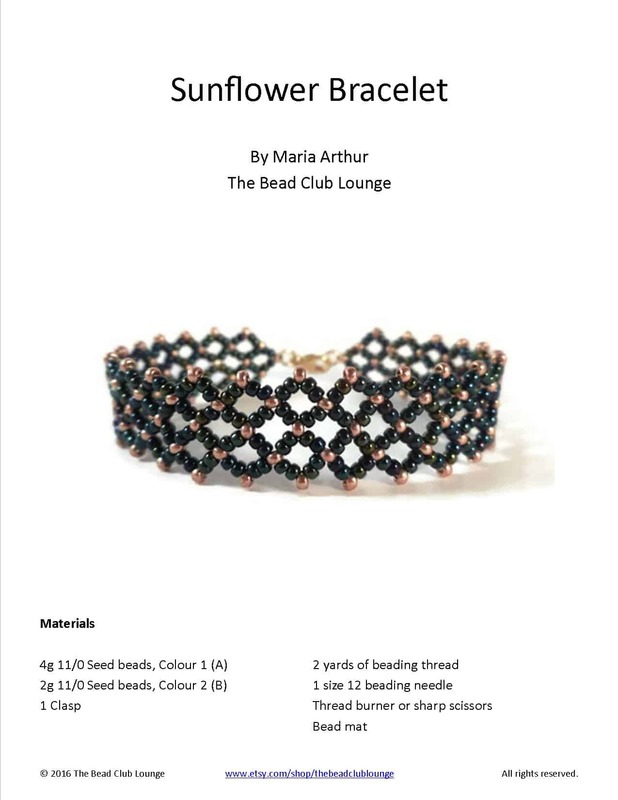 You can always find patterns in my shop: https://beadclublounge.com/shop-beading-tutorials/. I will have some tutorials coming out on the blog soon. Nice and easy to understand.